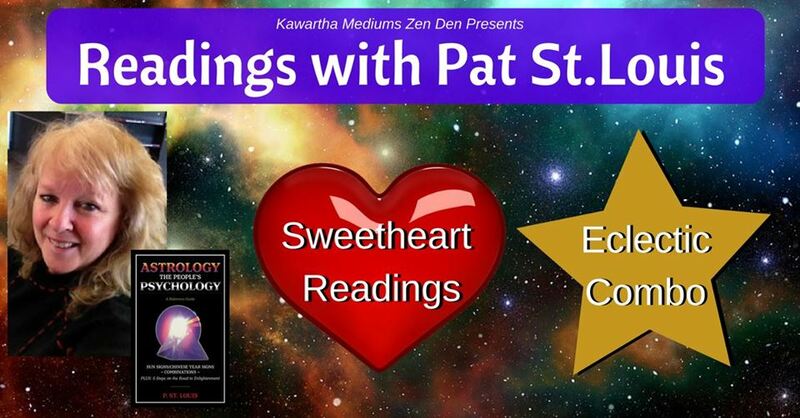 Pat St. Louis will be here at the Zen Den offering SWEETHEART Readings an her own custom Eclectic Combo! Pat will complete a reading with you and your partner using your Astrological Signs, Chinese Zodiac Year signs, Numerology and more to help you gain a deeper understanding of your relationship. Set yourself on the path to higher consciousness. Come for an adventure in self discovery and spiritual healing. Certified Master Healer, Pat St.Louis, accesses information through an ECLECTIC approach including astrology, palmistry, hand writing analysis and numerology; plus her connection with the angels.